A FAMILY ONLY funeral procession will assemble at the Funeral Home and accompany Juan Sr. to Mt. Olivet Cemetery for Interment services at 12:30 PM. Please make checks payable to Yolanda Casso. If mailing, please use the above address unless you have Mrs. Casso's address. If you are sending flowers, please ask the florist to have arrangements delivered to the Church by 2:00 PM on Thursday. Please scroll down for online link to directions to the Church, mailing information for memorials, and floral delivery information. Entered into his rest Sunday, August 27, 2017 at the age of 67. Juan is the beloved husband of Yolanda A. Casso (nee Alvarez). He is the cherished father of Juan Casso, Jr., Maribel (Ehren) Wilcott, Malena (Mark) Schumacher, Carlos (Brenda) Casso, Rojelio Jabez Casso, and Hadassa (David) Robinson. He is the loving grandfather “PaPa MeMe” of Lucas, Devin, Nicholas, Anabella, Marky, Micah, Jando, Carlitos, Paloma, Isabelle, and Valencia. Loving son of Guadalupe Casso. Further survived by 3 brothers, 3 sisters, other relatives, and friends. Juan was preceded in death by his father, Manuel Casso and brother, Carlos Casso. Visitation Thursday, August 31, 2017 at Pipeline To Jesus Church, 13400 W. Beloit Road, New Berlin, WI 53151 from 4:00 PM until the time of the Funeral Services at 6:00 PM. Private FAMILY ONLY burial services will take place at Mt. Olivet Cemetery on Friday, September 1, 2017. 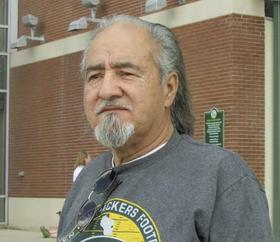 The Family will gather at the Niemann / Suminski Funeral Home, 2486 S. Kinnickinnic Avenue in Milwaukee at 11:30 AM on Friday to take Juan Sr. in procession to Mt. Olivet Cemetery for 12:30 PM burial services. Memorials may be directed to the Juan M. Casso Sr. Family in care of Yolanda Casso. Floral arrangements should be delivered to the Church by 2:00 PM on Thursday. To share a memory, eulogy, poem, or sign the online guestbook please click on the corresponding tab above.